Swiss voters have rejected a controversial corporate tax reform but eased the path to citizenship for third generation immigrants and approved new infrastructure funding in a triple referendum today. The proposal to relax restrictions on citizenship is a limited one which will apply to only around 25,000 people whose grandparents were mainly of Italian origin, and numerous hurdles will still have to be passed by this group to obtain the coveted Swiss nationality. However the referendum can be seen as marker for ongoing issues in the country around immigration, Islam and citizenship, with the right-wing Swiss People’s Party (SVP) campaigning against the reform. Similar proposals had been rejected in a September 2004 referendum. An attempt to harmonise corporate tax measures in response to international pressure on Switzerland over ‘tax haven’ incentives offered by some cantons to multinationals was soundly defeated. The complex measures would have reduced corporate tax rates for domestic companies while abolishing many special treatments deemed unacceptable by the international community. Polls ahead of the referendum had suggested opinion was fairly evenly divided: the result will cause uncertainty for the business sector and send the Federal Government back to the drawing board. Data source: Swiss government official website. Final results. 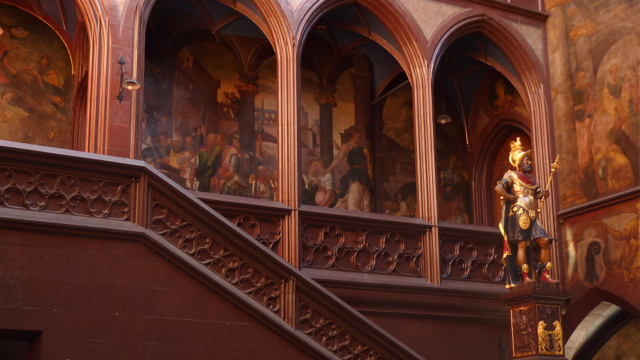 Photograph: Interior of Rathaus (City Hall), Basel, Switzerland. Photo: Andrew Cornwell. All rights reserved.